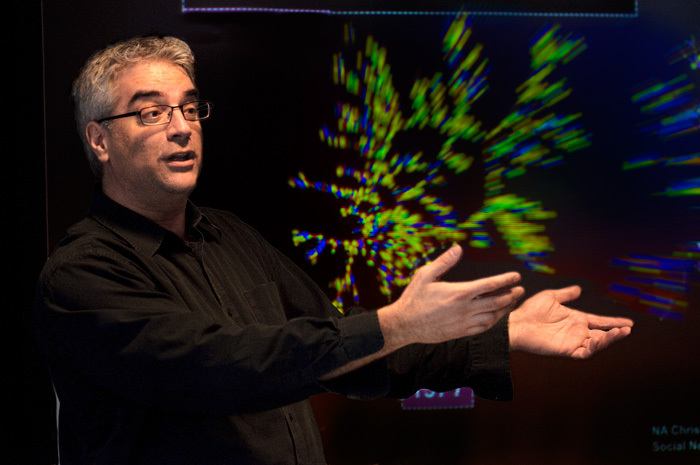 The lab led by Nicholas Christakis examines networks from all angles. Lee Fleming studies the influence of one's social-network structure on innovation and creativity. For ease or difficulty of processing and generating words in a given language, network structure matters. See a video of slime mold solving a laboratory maze, one of mold forming a Japanese railway system map, and three online-only sidebars. If a campaign volunteer shows up at your door, urging you to vote in an upcoming election, you are 10 percent more likely to go to the polls--and others in your household are 6 percent more likely to vote. When you try to recall an unfamiliar word, the likelihood you’ll remember it depends partly on its position in a network of words that sound similar. And when a cell in your body develops a cancerous mutation, its daughter cells will carry that mutation; whether you get cancer depends largely on that cell’s position in the network of cellular reproduction. However unrelated these phenomena may seem, a single scholarly field has helped illuminate all of them. The study of networks can illustrate how viruses, opinions, and news spread from person to person--and can make it possible to track the spread of obesity, suicide, and back pain. Network science points toward tools for predicting stock-price trends, designing transportation systems, and detecting cancer. It used to be that sociologists studied networks of people, while physicists and computer scientists studied different kinds of networks in their own fields. But as social scientists sought to understand larger, more sophisticated networks, they looked to physics for methods suited to this complexity. And it is a two-way street: network science “is one of the rare areas where you see physicists and molecular biologists respectfully citing the work of social scientists and borrowing their ideas,” says Nicholas Christakis, a physician and medical sociologist and coauthor of Connected: The Surprising Power of Our Social Networks and How They Shape Our Lives (2009). The basic elements of a network are simple: it consists of nodes connected by links (also called ties). But as the numbers of nodes and links increase, the number of possible configurations grows exponentially. Likewise, there are innumerable possibilities for what a node and a link can represent: a word, a gene, or a person, in the first case; phonetic similarity, coincident expression, or a conversation, in the second. Structurally simple, yet analytically incredibly complex, networks hold the answers to so many questions that at Harvard alone, the number of researchers studying them may reach three digits. Here is a sampling of the newest work in this dynamic field. Christakis, professor of medicine and medical sociology at Harvard Medical School (HMS) and professor of sociology in the Faculty of Arts and Sciences, and University of California political scientist James H. Fowler ’92, Ph.D. ’03, wrote Connected after discovering that each was working on a special case of network effects (the effect of a spouse’s death on one’s own health, for Christakis; the spread of voting behavior, for Fowler) and realizing they shared an interest in what else could be spreading through networks. The book is an exuberant romp through the field, presenting findings from medicine, epidemiology, evolutionary biology, sociology, anthropology, political science, economics, mathematics, and beyond. The authors discuss the spread of laughter, tastes in music, sexual behavior, and anxiety over nut allergies. They note one study that rigorously compared the structure of networks of myriad phenomena and found a strong similarity between the bill-sponsoring patterns of U.S. senators and social licking in cows. They report that Physarum polycephalum--slime mold--is more efficient than Japanese graduate students in finding the shortest route through a maze (the fungus can “collaborate” by fanning out in the form of a network to explore all possible paths); and share Japanese mycologist Toshiyuki Nakagaki’s follow-up studies, in which the fungus was as good as or better than humans at devising maps for railway systems in Great Britain and Japan. These studies, they say, demonstrate the problem-solving power inherent in networks. But the core of the Christakis-Fowler collaboration is original research on what spreads through human social networks. With data from the Framingham Heart Study, under way since 1948, they mapped more than 50,000 social ties among 5,124 people (who connected outward in turn to a network of more than 12,000 people). Because the study tracked all manner of health markers and asked subjects about an exhaustive list of behaviors--diet and exercise, medications, recreational substance use, emotions--it was a rich lode of data. The two men started publishing their findings with a splash: a 2007 article in the New England Journal of Medicine reporting that obesity spreads through social networks, as people are apparently influenced by friends’ weight gain to become obese themselves. More perplexing is their finding that obesity spreads through up to three degrees of separation. If a subject named a friend who was also in the study, and that friend’s friend became obese, the first subject’s chances of becoming obese were roughly 20 percent greater. Across one more degree of influence (husband’s friend’s friend or friend’s sibling’s friend--i.e., three degrees away), the risk was 10 percent greater. Weight gain appears to ripple through friend groups via some unseen mechanism such as altered eating or exercise behavior, or adjustment of social norms regarding weight. This map is a typical example of the computer-generated images used to help understand networks and network effects.A subset of the“obesity network” mapped by Nicholas Christakis and James Fowler, the image shows 2,200 subjects from the Framingham Heart Study (from a total of 12,067). Each dot, or “node,” represents one person (red borders indicate women; blue, men).The yellow dots represent obese people—those with a body mass index (BMI) of 30 or more—and node sizes are proportional to BMI. Colors of “ties,” or links between nodes, indicate relationship type: purple for friend or spouse, orange for family. Note the visible clusters of obese people; Christakis and Fowler report that network effects—in which one subject’s weight gain influences the BMI of those around him—help to explain these obesity clusters. For each trait that spreads through networks, Christakis and Fowler (and others working in the field today) meticulously chart how, and between whom, transmission occurs. Does geographic proximity matter? Are family relationships more influential than social relationships? What about people who work together? The answers vary depending on what is being transmitted. Precise knowledge is needed for the type of network-based public-health interventions they envision. In addition to knowing what works--in the case of obesity, perhaps distributing healthy recipes, or posting on Facebook or Twitter that you “feel so great after going for a run” to encourage friends to exercise--such interventions require knowing who is most influential, and this may vary from purpose to purpose. Christakis and Fowler write that a network-based vaccination campaign, targeting people with the most social contacts, could be three times more cost-effective than a campaign that aims for universal vaccination. Campaigns of the latter type over-vaccinate; immunizing only people who are hubs in social networks would enable administering a minimum of doses for maximum effect. (Recommendations that healthcare workers receive more vaccinations than average citizens follow a similar model, assuming that such workers will have more contact with sick people and thus are more likely to spread infections.) A network-based surveillance campaign, prioritizing well-connected people when monitoring infection’s spread, could be 700 times more efficient than random monitoring. But when it comes to diet and exercise, is it better to have people with more connections float the healthy recipes and exercise messages, or to have the positive signals come from close friends of the target? That puzzle has not been solved, even though efficient public-health spending depends on the answers to such questions. While Fowler and Christakis are concerned mainly with tracking the spread of behaviors and mental states through networks, Laura Bogart is interested in how information spreads through networks--and then influences health behavior. The associate professor of pediatrics at HMS and researcher at Children’s Hospital Boston has used a social-network perspective to study the spread of HIV conspiracy beliefs. She led a national telephone survey of African Americans in which more than half the respondents agreed with the statements “There is a cure for AIDS, but it is being withheld from the poor” and “A lot of information about AIDS is being held back from the public.” Such beliefs “are a response,” she says, “to years of discrimination, and years of reasons to be suspicious about medical treatments, including unethical practices in the medical system and knowledge about wide disparities” in care. These beliefs may indeed be a natural response under the circumstances, but they are dangerous: male respondents who agreed with the conspiracy statements were significantly less likely to use condoms consistently. In a separate study of HIV-positive patients, Bogart found that giving credence to such beliefs was negatively correlated with adherence to treatment: 25 percent of patients who did not follow treatment recommendations also agreed with the statement, “People who take the new medicines for HIV are guinea pigs for the government,” versus just 8 percent of patients who did take their medication as directed. And in a third study, Bogart used social-network analysis to determine that the greater the number of friends who had mentioned a conspiracy belief to a study participant, the more strongly the participant believed the statement. She has now begun a larger-scale study of how HIV information--conspiracy theories and otherwise--flows through social networks. Her team will track 240 HIV-positive African Americans in Los Angeles for one year, as they go in and out of treatment, on and off medications, and friendships form and erode. Later she hopes to test interventions, identifying “opinion leaders” in the community and offering them HIV education in the hope that they will spread scientifically accurate information that will supplant the myths. In fact, beliefs and medical mistrust can “have a huge influence on health behaviors,” she says. But research and policy discussions tend to focus so much on structural impediments to care--not having transportation to the clinic, lacking insurance--that “we forget that people, in the best of circumstances, sometimes still will not take their medication.” Her work highlights the importance of social networks in explaining why. Martin Nowak became interested in networks while trying to develop equations to explain how cancer emerges in the body. “I realized that in order to write down these equations, I had to understand the network of cells in the body,” says Nowak, professor of mathematics and biology and director of Harvard’s Program for Evolutionary Dynamics. Nowak began this mathematical quest by studying colon cancer, which arises in crypts--tube-shaped glands (below) that produce the cells to renew the colon’s lining as old cells slough away. Each crypt comprises 10,000 cells, with one stem cell, or a few at most, at the bottom. Nowak characterized each crypt as a network, with the stem cell(s) at the center and the genetic material passed along through each cell division, from precursor cells to terminally differentiated ones. Each crypt is a dynamic network, changing with time: as the cells at the end of the line--the inner surface of the colon--die away, new cells replace them, although the lineage still begins with the same stem cell. Colon crypts (blue) are visible in this colored light micrograph of a human colon section.Through multiple divisions, the stem cells at the bottom of each crypt give rise to the terminally differentiated cells that form the colon lining (top).The crypts helped Martin Nowak craft a mathematical description of networks that suppress selection: they are organized in a way that discourages the development of cancer. Cells near the surface, which divide often—making cancerous mutations relatively likely—are soon sloughed away, but in stem cells, which pass on mutations to all their daughter cells, division is much less frequent. Nowak and colleagues have seized on this attribute as the defining feature of networks that suppress selection: even strongly advantageous mutations do not spread through the population. Their theory, published in Nature in 2005 and 2006, offers a mathematical description of some networks that make sense intuitively: for example, a small lake feeding a stream that flows into a larger lake. Within each lake, natural selection will operate freely in the fish population. Mutations that occur in the smaller lake will affect fish in the larger lake--but mutations that occur in the larger lake, no matter how advantageous, will never reach the fish in the smaller lake because the stream flows only one way. The 2005 Nature paper also set forth structures that amplify selection, including a star-shaped network with one central individual connected to all other individuals, but without connections among the outlying nodes. These structures can be used to understand not only genetic evolution, but also cultural evolution, says Nowak: “If one person has an idea, which network is best for the spread of this idea?” The star structure works well if all the connections are bidirectional (see diagram at right): a good idea that originates in the center is immediately transmitted to the outlying nodes. A good idea that originates at one of the outlying nodes quickly reaches the center and is disseminated from there. Thus, Nowak’s research, which began with cancer-cell biology, has flowered into a broadly applicable theory of network structures that inhibit or promote natural selection. At harvard and elsewhere, network analysis is evolving at an explosive pace. Scholars are using methods they could never have imagined, with collaborators they might never have envisioned, to analyze, in some cases, entirely new types of data. Another Christakis collaborator, assistant professor of statistics Edoardo Airoldi, is tracking the spread of news on the Internet; the study’s purpose is primarily theoretical (it aims to better understand the concept of diffusion in networks), but it will require inventing new tools that could have practical applications for journalism and public relations. Jukka-Pekka Onnela, a physicist who is a postdoctoral fellow in the Christakis lab, has used network analysis to help understand patterns of movement in stock markets--a method that has been picked up by at least one national central bank. A more lighthearted study led by a member of Christakis’s lab group searched for meaning behind users’ decisions to make their Facebook profiles public or restrict who can view them. It found that users with public profiles had a higher-than-average chance of listing the Beatles, Pink Floyd, and Led Zeppelin among their favorite musical artists, whereas people who restricted access to their profiles were more likely to list Coldplay, Rage Against the Machine, and Ray Charles. The taste for privacy (or public exposure) may be correlated with a personality type that also prefers certain musicians; the researchers aren’t quite sure, yet, of the deeper meaning (if any) behind the predilections and associations they observed. But in the online world and the other frontiers that network scientists are exploring, making sense of new data is a crucial task; the Christakis team is diving into genetic, as well as digital, data in search of new insights about human social tendencies (see the online sidebar, “Costs and Benefits of Connections,” described on page 46).